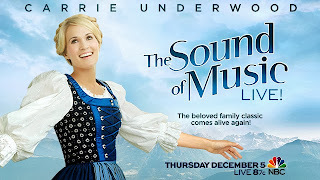 grandma's cookie jar: The Sound of Music LIVE - and a Fun Give-Away! story! I LOVED the music! I LOVED the scenery of the movie! Well, you likely have gathered I am someone who enjoys this movie . . . I still, to this day, burst out in song (at least in my mind!) whenever I hear any of the songs from this classic movie! So, when I heard they were making a new Sound of Music with Carrie Underwood playing the part of Maria, I was THRILLED! Then, when I was invited to participate in a "viewing party" I knew I was really going to ENJOY the Sound of Music LIVE! 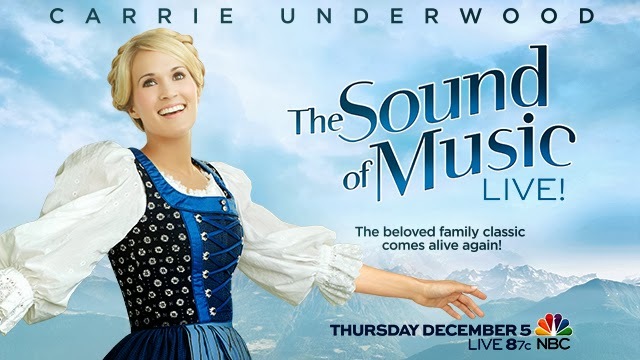 So, since the show is on this evening: on your local NBC station at 8pm, I wanted to share with you some fun information on this - check the video below for the making of the Sound of Music LIVE - it will be like going to a Broadway show in your own livingroom! Enjoy! For more fun, I'll be giving away a Sound of Music Prize package which was made available to me for free to give away and includes a Sound of Music poster, Sound of Music t-shirt and the CD Sound Track for the Sound of Music! (USA only) If you are 18 and older and would like to be in this drawing which will be on December 15, 2013, all you have to do is at least one of the following: follow on Google+, Google Friend Connect, follow by liking on facebook with the tab at this link (not just liking the post) and/or have followed grandma's cookie jar by email. For each of these which you have done you will receive one entry. In addition, if you "share" this post, you'll receive an additional entry (please let me know if you share!) This will help me be able to draw names from among people who would like to win the Sound of Music LIVE prize package and it gives you several ways to enter the give-away! PLUS - if you tweet during the show you'll get an extra entry (be sure to let me know if you tweet) AND, check my twitter account throughout the show as I will be tweeting! If you retweet any of my tweets you'll receive two extra entries for each retweet!!! What is your favoirte Sound of Music song? My favorite is Edelweiss! Comment with your favorite for an extra entry! We love the Sound of Music. We've heard the great-grandchildren of the Captain and Marie sing many times. Our favorite is the song, "So Long, Farewell". Sound of Music is one of the those things I can never get tired of. My favorite song is Climb Every Mountain...or Favorite Things..or who am I kidding...I LOVE THEM ALL!!! I follow on fb and email. I love "My Favorite Things!" My favorite song (right now) is Do a Deer. I love to hear my 3 year old sing "Re a golden drop of sun!" at the top of her lungs! It's just a little off the actual words and it makes her so happy to belt it out this way.